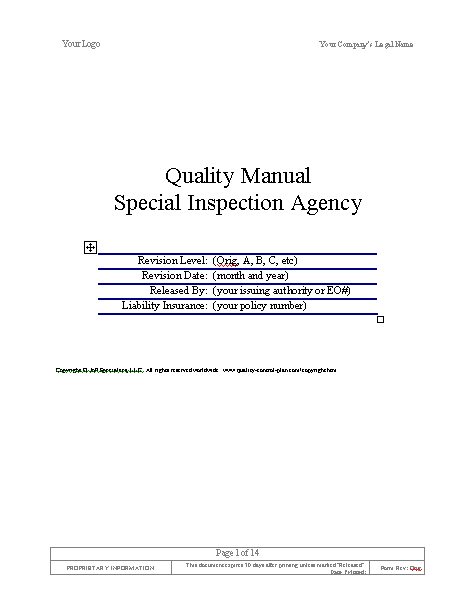 Construction quality control products are in MS Office format. In evaluating the construction management program, consideration should be given to Customer emphasis areas and the observations and findings of similar programs. This evaluation should be incorporated in the risk assessment procedures. As appropriate, the risk assessment should provide for evaluating various phases of the program on a regular basis. Program areas where no major problems exist may not require detailed review. Major problems and those where insufficient information is available for drawing conclusions are candidates for review. A fundamental component of construction program management is an understanding of contract administration and construction quality. Contract administration is broadly defined as taking a project specification and producing a desired end product. Construction quality management involves traditional quality assurance measures employed to control and verify construction, material and product quality. It also encompasses broader topics of continuous quality improvement. For instance, optimization of decision-making processes, innovative contracting practices for enhancing quality, performance feedback mechanisms, specification improvements and design refinements. Quality construction is critical to a successful construction program. Completed construction projects represent tangible products that ultimately define the success of construction projects based on the level of delivered quality. This may include a variety of issues, such as safety characteristics, operational efficiency during and after construction, materials quality and long-term durability, and financial value. Effective construction quality management applications can provide the Customer with confidence that completed construction work meets the objectives for success. Quality assurance (QA) is the systematic process necessary to ensure the quality of a product. This all-encompassing term includes quality control, acceptance, independent assurance, dispute resolution and the use of qualified laboratories and personnel. Generally, discussion of the basic who, what, where, when and how should comprise three to six pages. Include an additional two to four pages of detailed information for each major category of work. This does not include supplemental materials such as Subcontractor and Supplier plans, certifications, test data, and personnel resumes. Also, the construction quality system should not contain repetitions of contract specifications and meaningless platitudes from quality textbooks. No matter how much detail is in the plan, it can always be argued that more could be or should be included. 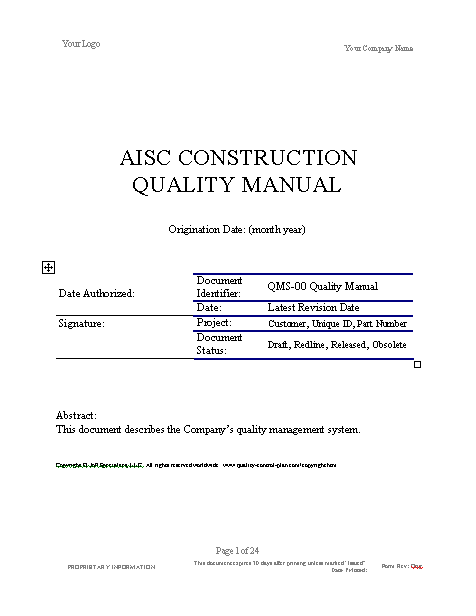 QC Plans for other projects can be developed following the above format. The level of detailed information in any QC Plan will obviously change depending upon the size and complexity of the individual construction project. The above content is designed as a template and guide. 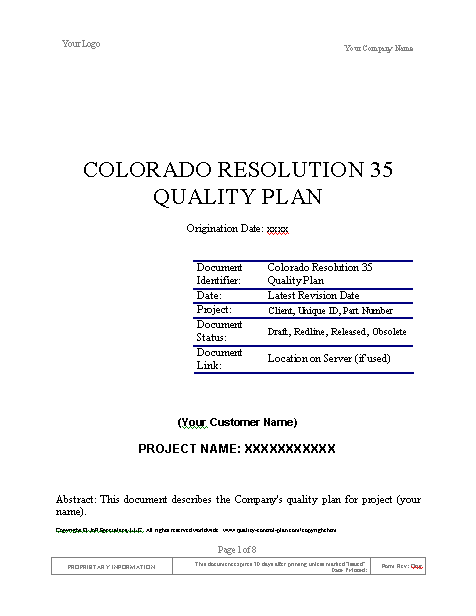 Each QC plan should include samples of forms and reports that are appropriate to the project type.